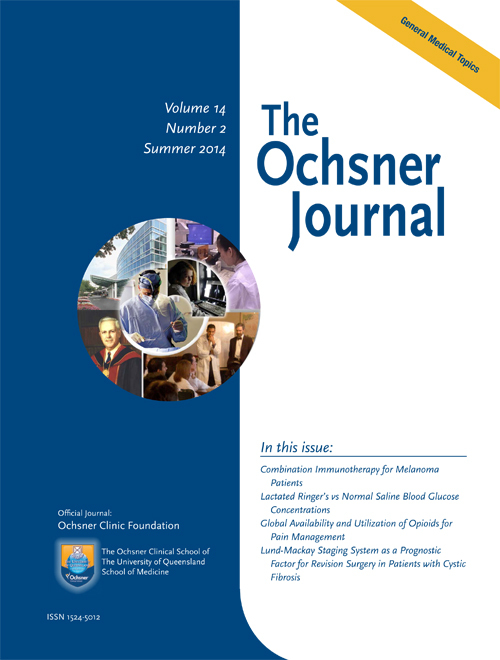 The summer 2014 issue of Ochsner Journal offers an array of topics from editorials on mentorship to original research on postoperative care management. Under the direction of Editor-in-Chief Dr. David Beck, the issue comprises 3 editorials, 5 original research articles, 5 reviews and commentaries, 14 case reports, and the Journal’s 3 recurring quarterly columns. The issue also includes a list of recent publications from Ochsner authors. The complete issue is available at The Ochsner Journal website and through PubMed Central. The Editorial Board is proud to highlight Dr. Adam Riker as a featured contributor. A director of the Cancer Institute at Advocate Christ Medical Center in Oak Lawn, Illinois, Dr. Riker has a range of scholarly interests, particularly focusing on surgical oncology, immunotherapy of cancer, genomic diagnostics, and novel treatments in targeted therapy. He contributed an original research article about combination immunotherapy in melanoma patients and a case report of amyloidosis to this issue of the Journal. Dr Riker’s article about combination immunotherapy for melanoma patients was announced at the 2014 annual meeting of the American Society of Clinical Oncology because of its promising findings. Keep up with the latest issue of Ochsner Journal by signing up to receive an electronic table of contents for each quarterly issue. Please click here to complete the form.